While made on a relatively small budget considering all of the ballet choreography, Center Stage didn’t manage to captivate audiences during its first theatrical run. In the years subsequent, however, Center Stage became a rom com go-to which mixes beautiful dance sequences with a pretty epic love triangle. Because of this, it’s really no surprise that Lifetime would be interested in doing a follow-up to the theatrical release, which is how we are getting Center Stage: On Pointe. 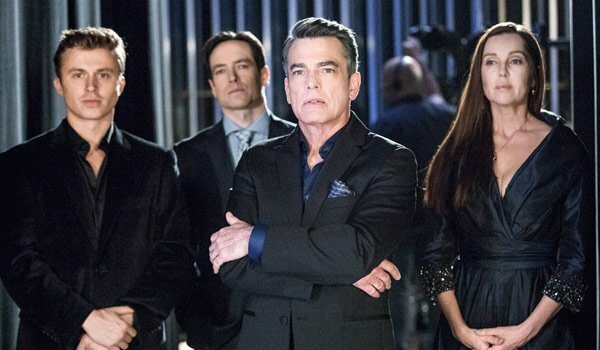 Now, we’ve gotten a first look at the upcoming TV movie, and we are pleased as punch to note that Lifetime is bringing a bunch of original characters back. Honestly, could the return of the ballet drama get any better? Yes, Peter Gallagher is back playing the head of the ballet, aka the American Ballet Academy’s Jonathan Reeves. Sascha Radetsky, who recently popped up in the Starz drama Flesh and Bone is returning to play Charlie. While Charlie was in the American Ballet Academy during the first movie, he’s a lot older now and is playing an instructor. Plus, Ethan Stiefel is back to play Cooper Nielsen, who is still a choreographer for the ballet. In the original movie, there was a love triangle between Cooper, Charlie and a young dancer named Jody (Amanda Schull), who won’t be back for the Lifetime movie. At the end of the theatrical movie Cooper had started his own company, but in the 2008 follow-up to the theatrical film that aired on Oxygen, Cooper had returned to ABA, which explains how all three of these characters are back for the movie. E! reports that Center Stage: Turn It Up characters Tommy and Bella will also be back for the Lifetime movie On Pointe. Bella, who is played by Defiance’s Nicol Munoz, will be the star in the new movie, but Dance Moms’ Chloe Lukasiak apparently also has a part. The new TV movie will have similarities to the theatrical movie, with the ABA looking to take the ballet in a more modern direction--a move that is probably more up Cooper's alley than Jonathan Reeves'. Like the original, the new flick will also focus on a female lead. Center Stage: On Pointe will hit the schedule this summer on June 25. To find out what other TV projects are coming up this summer, check out our TV premiere schedule. We'll let you know if any further details regarding Center Stage: On Pointe break.